Welcome as we go 2 for 2 for the 21st time this season. Here is everything you need to know about this coming weeks pitching matchups and our 2 choices for pitchers that have two favorable starts on the schedule. These are the pitchers that you may consider adding to your weekly roster or ones that you may want to pick up and stream a start. If you are new to this game or unfamiliar with the strategy of streaming starting pitchers, click here for a refresher and some great links you can use. Also included in this article are some SP notes to help you decide on next weeks roster, followed by one streaming starter for each day of the week that the stat geeks over at the Muthaship think will be a viable option for your fantasy roster in the coming days. And if all this wasn’t enough, it’s followed by a great recipe. 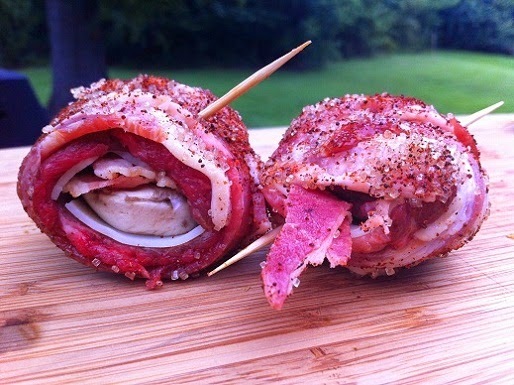 This time it’s Bacon Wrapped Steak Bites. Chris Tillman struck out nine White Sox hitters, allowing just one run over eight innings in the Orioles’ 5-1 victory on Tuesday. Tillman served up a solo home run to Jose Abreu in the first inning, but he buckled down to hold the Sox scoreless over the next seven frames. The right-hander gave up just three hits and a walk on the evening en route to his 10th win. Tillman won’t match his 16-win performance of 2013, but he’s somewhat quietly put together a nice season again this year. Tillman owns a 3.55 ERA heading into Monday’s start against the Rays. Orioles right-hander Chris Tillman won after allowing one run on three hits — including a home run — and one walk with nine strikeouts in eight innings against the White Sox on Tuesday.Tillman allowed a solo homer in the bottom of the first inning, but he immediately settled in after that through eight frames in a fantastic outing. The 26-year-old was rewarded with his 10th win, and he now holds a 3.55 ERA, a 1.23 WHIP and 114 strikeouts in 164 2/3 innings. Tillman may not be an elite fantasy pitcher, but he has shown that he can be useful in most formats at this time. His next start is scheduled for Aug. 25 at home vs. the Rays. Chris Tillman turned in an excellent start Tuesday against the White Sox. Tillman allowed one run on three hits over eight innings. He struck out nine and walked one. The only blemish against Tillman was a solo home run by Jose Abreu in the first inning. Tillman would give up his two other hits in the second and third inning. He then tossed three perfect innings before walking Abreu in the bottom of the seventh. Tillman worked around the walk, and did not allow a hit over his last five innings. With the win, Tillman improved to 10-5. He’ll take on the Rays in his next start. Kyle Lohse (ankle) will rejoin the Brewers’ rotation on Monday in San Diego. Lohse hasn’t started since August 13 due to a sprained right ankle. He probably could have returned by now, as his throwing program wasn’t interrupted, but the Brewers could afford to take it slowly with him with Jimmy Nelson and Mike Fiers pitching so well. After Kyle Lohse threw a successful bullpen session at Miller Park on Friday, Brewers manager Ron Roenicke announced that the right-hander would be the team’s starter for the series opener in San Diego on Monday.Lohse skipped his most recent turn in the rotation due to a sore ankle that had been hampering his mechanics over his last few starts. Lohse rolled his ankle Aug. 2 in St. Louis and aggravated the injury in an Aug. 13 start at Wrigley Field, and with two off-days this week, the Brewers were able to skip him without bringing another starter into the rotation. Roenicke said Lohse “threw the ball really well” in Friday’s session, and the right-hander agreed. Kyle Lohse will rejoin the club’s rotation Monday, according to the Milwaukee Journal Sentinel. Lohse had his last start skipped due to an ankle injury. He’ll take on the Padres Monday. Lohse has a 3.49 ERA over 159 2/3 innings. The Chicago White Sox will require a sixth starter for one of the games of their Saturday doubleheader, but they haven’t yet hinted who it will be. The Boston Red Sox demoted Brandon Workman to Triple-A Pawtucket following his Aug. 23 start, and while they might recall someone to take his place on Friday, the team could also merely go with four starters for Week 21 due to Thursday’s off day. The Detroit Tigers demoted Robbie Ray to Triple-A Toledo following his Aug. 22 start, leaving them in need of two spot starters during Week 21, due to a Saturday doubleheader. Ray could be recalled for one of those games thanks to the 26th-man rule, and Buck Farmer could be recalled to start the other game. Anibal Sanchez (pectoral) isn’t close enough to being ready to pitch this week. Wade LeBlanc is expected to assume the injured Garrett Richards’ (knee) spot in the Los Angeles Angels’ rotation, beginning on Monday. The Minnesota Twins could choose to keep Yohan Pino, one of their scheduled starters in their Aug. 23 doubleheader, in their rotation. In all likelihood the team would choose between him and Trevor May, who is also scheduled for that day. The Oakland Athletics used their multiple off days during Week 20 to push back Jason Hammel in their rotation to Tuesday of Week 21, and now they say they might consider Jesse Chavez or Drew Pomeranz for that spot. Whomever gets the assignment would be aligned for two starts. The Texas Rangers originally hinted that Yu Darvish (elbow) could come off the disabled list to start Monday’s game, lining him up for two starts, but manager Ron Washington backtracked from those earlier statements. It is unclear when Darvish will return. Jacob Turner will replace Edwin Jackson (lat) in the Chicago Cubs’ rotation beginning on Wednesday. The team will also need a spot starter for Saturday’s doubleheader; Felix Doubront is considered the leading candidate for one of those games. The Cincinnati Reds can push back their fifth-starter spot back to Saturday, after which point Dylan Axelrod appears the most likely candidate to be recalled. If the team instead chooses to keep everyone on regular schedule, however, Axelrod could start as early as Wednesday. Christian Bergman (hand) will be activated to rejoin the Colorado Rockies’ rotation on Aug. 24, lining him up for a Friday start during Week 21. Hyun-Jin Ryu (gluteal) is eligible to rejoin the Los Angeles Dodgers’ rotation on Saturday, and manager Don Mattingly hinted that the left-hander indeed might within a day or two of that. However, it makes a lot of sense for the team to merely wait until Sept. 1, when rosters expand, to activate him. Kyle Lohse (ankle) is expected to rejoin the Milwaukee Brewers’ rotation on Monday, setting him up for a two-start week. Jimmy Nelson will move back to Tuesday and lose his second start. The New York Mets expected to get Bartolo Colon (personal) back into their rotation on Aug. 24, lining him up for a Saturday start during Week 21. The St. Louis Cardinals might need a sixth starter this week due to their Saturday doubleheader, or they could use Thursday’s off day to push such a decision back as late as Sept. 2. They haven’t yet hinted at their plans. San Francisco Giants manager Bruce Bochy said following Tim Lincecum’s Aug. 23 start that the right-hander might have his next start skipped. Yusmeiro Petit would be the most likely fill-in if the Giants choose to go in that direction. Tsuyoshi Wada (@STL, Saturday): It’s difficult to bet against Wada, as he has a 2.31 ERA and 1.07 WHIP in the month of August, and will be facing a St. Louis Cardinals team that has never before faced him while working at pitching-friendly Busch Stadium. Jimmy Nelson (@SD, Tuesday): Even with the San Diego Padres hitting better — .267/.340/.389 since the All-Star break, for a second-ranked .318 team wOBA — Petco Park remains an advantageous venue for a pitcher, as opposing starters are 6-for-12 in quality starts with a 4.50 ERA there during that time with five of the ones who failed to qualify shaky fantasy types anyway (Tyler Matzek, Mike Minor, etc.). Nelson is 5-for-6 in quality starts since the All-Star break. Hector Santiago (MIA, Wednesday): He has a 2.08 ERA and 1.04 WHIP in three starts since moving back into the Los Angeles Angels’ rotation, and while his walks are a concern — he had seven in 17 1/3 innings during that same stretch — he is also a pitcher with swing-and-miss stuff facing a Miami Marlins team that has the majors’ highest strikeout rate versus left-handed pitchers in August (31.4 percent). Bud Norris (TB, Thursday): He has been quite good at Camden Yards this year, with a 2.86 ERA and 1.20 WHIP in nine starts, and he has limited current Tampa Bay Rays to lifetime .267/.364/.360 rates with a 20.5 percent strikeout rate. Scott Feldman (TEX, Saturday): He’s 2-for-3 in quality starts with a 3.44 ERA against the Texas Rangers this season, and current Rangers combined are lifetime .248/.295/.391 hitters against him. Chase Anderson (COL, Sunday): He sure likes the home cooking, going 6-for-9 in quality starts with a 3.27 ERA and 1.28 WHIP at Chase Field thus far this season. What’s more, he’s 2-for-2 in quality starts versus the Colorado Rockies in 2014. Jorge De La Rosa (@SF, Tuesday): On a weak day for streaming starters, go with the left-hander with seven quality starts in his past nine games who is facing a San Francisco Giants team with mere .258/.302/.373 rates and an average of 4.7 K’s per walk against left-handers since the All-Star break. 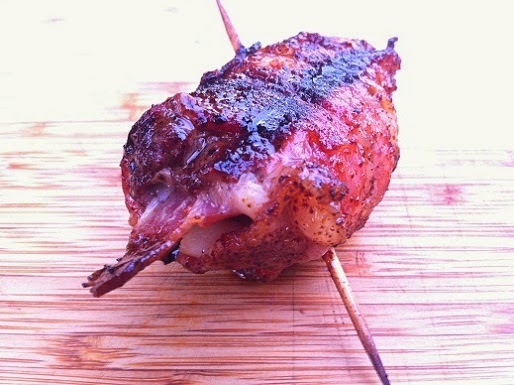 Here is a fun and tasty little thing to throw on the grill; bacon wrapped steak bites! These are real simple to make. Start with some sirloin steak and cut it into strips about one inch wide and two inches long. Grab a mallet and pounded the steak until you have nice thin strips. Season both sides with Montreal Steak Seasoning (or whatever else floats your boat). 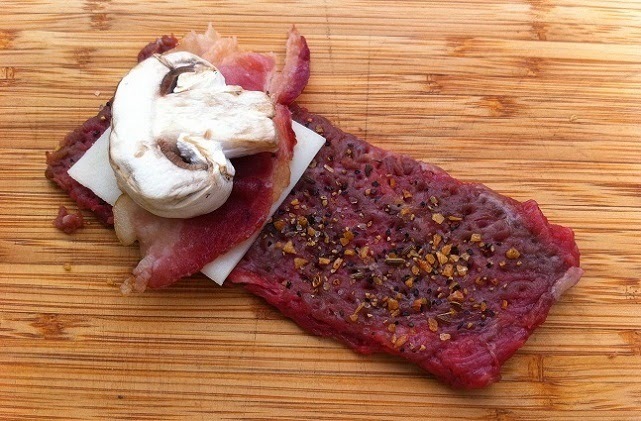 Add a piece of Swiss cheese, a mushroom slice and a piece of precooked bacon on one side of the steak strip. Dust with some chili powder and brown sugar then grill with indirect high heat until the bacon crisped up a little.